His face is synonymous with humour, and it is very popular on the screen. 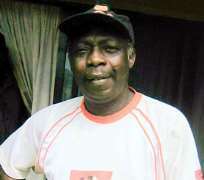 In Yoruba films, he is popularly known as Ajirebi; while a wider audience on the network know him as Pa James in the popular Papa Ajasco series. He is that clownish character in the Wale Adenuga-created television series, always looking for an easier but less noble way of living, and always in connivance with the rascally Boy Alinco. His real name is Kayode Olaseinde and he took to the theatre in 1975. Then working with the UTC in Apapa, Lagos, Pa James would always find a way to put up appearance anywhere there was a theatre group. Because of his love for theatre, he lost his job and suffered for it bitterly when his family became angry that he left certainty for uncertainty. He told Spectacles, “My father loved his children so much and would love to send us to school to become educated. But after my primary school, there was no money to send me further. So, I found my way and started working for a living. I joined the UTC in Apapa, Lagos, as a factory worker, but I discovered that my mind was always with the acting world having been fascinated by the likes of Hubert Ogunde and Pa Ogunmola. One would have thought that such strong pull for acting was influenced probably by the prospect of earning higher than his paid job, but Pa James said it was just for the love of it. Respite however came for Pa James with the advent of home video when artistes were paid as much as N15, N20. Pa Jimoh said he was collecting the stipend gladly because, according to him, he never thought something tangible in terms of money could come out of acting. “I was so happy the day I was paid N50 for appearance. I felt great that I could get so much from acting plays. For me, the greatest satisfaction for me in acting was the fame, to get seen on the TV was enough for me. But later I started getting N150, N200 and here we are today. We thank God,” he told Spectacles. Pa James said he would have remained forever at the mercy of marketers for peanuts but for the intervention of Wale Adenuga, who invited him to the popular Pa Ajasco and Company. He said he was glad to tell the world that his relationship with the creative producer of the comical series has bailed him out of penury. Pa James, who has a wife, told Spectacles that he is happy with his marriage. He said he had no plan to go beyond what he now has because, according to him, he can not manage even a half of an extra wife.